Waterman offers custom engraving on most of products. We use a precise laser engraving machine which gently etches away the top layer of the pen to reveal the base metal underneath. Lacquered Waterman pens generally have a brass metal underneath, and engraving will therefore have a gold finish. We've engraved Waterman pens for all occasions: birthdays, Christmas, anniversaries, weddings, christenings, graduations. The list is endless! Our meticulous engraving process and quality control means we will only engrave one pen at a time. We have 2 working days to dispatch Your order with engraving. How much does engraving of Waterman pens costs? The cost per pen engraving is £6.90. If you're buying a 2 pen set the cost of engraving is reduced to £10. As you click button "add engraving +£6.90." and type in your message, you will be able to view how it will appear on your chosen pen. The Visualisation shows the approximate size, colour and position of the engraving. Please note that the preview is an indication, and exact results may vary. The following Waterman pens and pens are not engraved: CHARLSTON line, some products from the HÉMISPHÈRE line (red, blue, purple), DELUXE products (on the cap) and the Ombres & Lumieres series. The manufacturing technology of these products does not allow the use of laser engraving. Professional engraving made on a special laminate in gold or silver. The unique computer-controlled device allows you to obtain high quality lettering on the surface of the plate. The engraved text does not wear off, it is very durable. The plate is placed on a box with a pen or a pen. The size of the plate depends on the size of the box. The products Parker can engrave a graphic or logo chosen; In this case, please prepare and send to the store's address a file in vector graphics. Only this format will allow you to prepare the correct engraving. 2. Add the engraving - please click button "add engraving +£6.90." or do it when you add a product to Your cart. 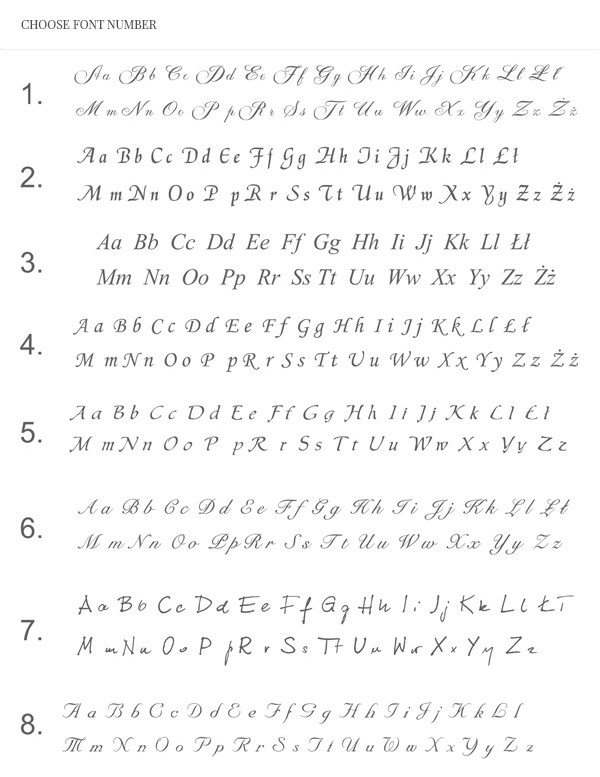 Select the font you want for your engraving and choose the font size. Choose any message you want as long as its within the character limit and click 'Confirm'. Please note we will engrave exactly what`s in this box so be extra careful of what you type! We cannot take telephone orders for engraving, if you wish to have your pen engraved please do it through our website or e-mail. Which part of the pen do you engrave? Therefore, pens may be engraved either on the cap or the barrel depending on the shape of the pen. You can check it out on our visualization engraving. See the sample video, how to make the visualization engraving yourself.